Quick Hit: Buster Keaton money? Finally, a Guide to the Marx Brothers! This is the first post in what will likely be a lengthy series of posts about double acts and how they work. I think about this way too much. I have an awful lot to say on the subject of double acts. I adore them to death and I’ve found that there’s a dearth of scholarly exploration of them and their psychology. I’ve found two books on Amazon that cover the topic of comedy teams – one by Leonard Maltin and another by Lawrence J. Epstein. Neither of these books appears to specifically delve into the concept of the double act itself, instead focusing on how all the different comedy teams covered operated. I’m going to try to explore the psychology of the double act in more depth here and see what my brain spits out. Second Performer: Oh, you went to the races last week? By the end of the 19th century, though, double acts evolved into what we know them as today. This is, of course, an extremely abridged version of what actually happened, but it gets the general point across. As time went on, the performer repeating the comic’s lines developed into what we know as a proper straight man today, delivering lines that would instead set up jokes for the comic (i.e. acting as a feed). By the time Weber and Fields popped up in the late 1800s, the dynamic had evolved into something recognizable to us – two individuals bantering and cross-talking on the vaudeville or music hall stage to the delight of the crowd. Often, things got rowdy between the pairs, and slapstick violence was incorporated. Weber and Fields were particularly adept at arguing, and indeed, arguing became a very common element of double act routines. The characters on the stage just never got along no matter what, and audiences loved it. In the late 1910s and early 1920s, things began to take a more genteel shift, with Gallagher and Shean emphasizing less slapstick and more singing. (Al Shean was the uncle of the Marx Brothers.) Although the team’s Mr. Gallagher and Mr. Shean song was wildly popular, the two fought often and broke up twice, revealing another commonality we find in many double acts – they often don’t get along in real life. The most famous double act in the history of the world, however, got along perfectly fine. I could go into great detail about how Laurel and Hardy were initially paired together in 1927 and whatnot, but that’s covered in a purposely bad PowerPoint I made and put up on Tumblr. (It’s a meme, guys.) What I’d like to approach here instead is the psychology of their particular double act and why it changed the preset rules. As mentioned, before these two showed up, the characters double acts portrayed generally didn’t get along on stage – and when they did get along on some level, like Gallagher and Shean, they didn’t get along off-stage. Stan and Ollie pretty much got along everywhere. Their characters were clearly friends, and as unintentionally destructive as they were you knew their friendship would be intact at the end of every single film in some way, shape or form. (Yes, even The Flying Deuces.) The characters stuck together no matter what, and if a threat arose towards one of them, both of them would stand firmly together to face it. Well, not always, but at least if they ran away they always ran away together, too. 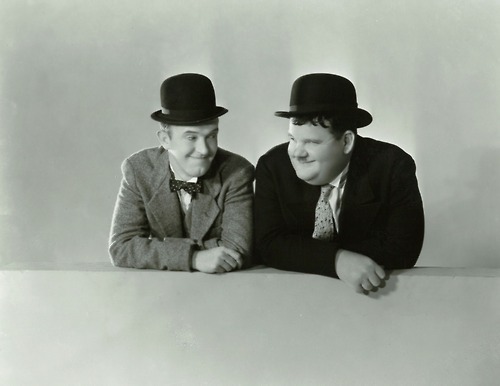 Here’s the point, though – up until Laurel and Hardy became the most famous double act in the world, double acts mainly entertained people by either being violent towards each other or by singing comic songs and bantering back and forth. The key to Laurel and Hardy’s success as an act is the fact that their act revolved instead around the relationship between the two characters, a model that redefined how double acts work. Most double acts that came after them relied on the interplay and bonding between the two characters (or, in the very interesting case of Dean Martin and Jerry Lewis, the relationship between the actual actors) – the Stan and Ollie model stuck. Eric and Ernie sharing a bed. In the double acts that follow (Abbott and Costello, Martin and Lewis, and Morecambe and Wise) we see that the characters are good friends, even if they do bicker over things. The actors, of course, were often another story. Bud Abbott and Lou Costello reportedly had a rocky relationship, and Dean Martin and Jerry Lewis had a major breakup before reuniting in the 1970s and reconnecting. 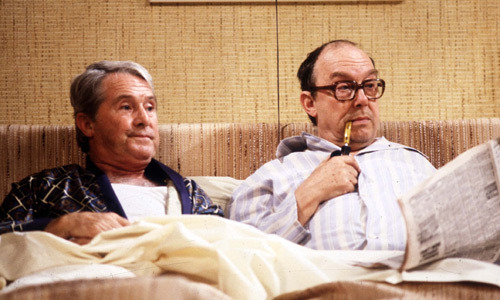 Morecambe and Wise, however, followed the Stan and Ollie model to a tee, with their characters sharing a bed on screen (like Stan and Ollie did) and by being extremely good friends in real life. In other cases, such as Peter Cook and Dudley Moore, the characters’ interactions suspiciously mirrored the real-life tensions between the two comedians – Cook and Moore’s fictional alter egos got into it more and more until they broke up. Most English-language double acts since the early 1980s have come from the UK, with US double acts mostly evolving into the characters we see in buddy movies. (Note the main photo for the Wikipedia article.) However, some American comedians in larger ensembles (SNL, the cast of Whose Line is it Anyway?, etc.) often end up falling into double act roles the longer they work together, which reinforces the fact that double act partners do frequently become friends. (Not that these friendships always last, of course, but that will be a good post for another time.) Double acts often appear in fiction, as well, with two fictional characters filling the traditional roles of the characters the comedians portray. It’s clear that the double act is very deeply engrained in popular culture – and indeed in human culture, since humans quite often do ‘pair off’ socially. In subsequent articles, I’ll explore the psychology behind many of these pairs specifically and discuss them in greater depth, hopefully tracing the development of the double act from its origins in music hall and vaudeville up to the present day – and what each depiction’s social ramifications are and what these portrayals can tell us about the social climate and culture from whence they came.